Begin your excursion in the small downtown area; all attractions can be explored on foot. PLAZA 31 DE MARZO: Head first to the city's main square, surrounded by 16th century buildings. Some are former homes of the city's Spanish conquerors. This is the city's social center and draws visitors and natives together. On the square's north side is the 17th century Cathedral, noted for its elaborate gold leaf interior and altar, and distinctly indigenous flavor. To the west is the Palacio Municpal, a 19th century neo-classic building with interior courtyard. To the south is the square's oldest structure, the Casa de Diego Mazariegos (now the Santa Clara Hotel). This is one of Mexico's finest examples of 16th century Plateresque styling. TEMPLO DE SANTO DOMINGO: About four blocks north of the zócalo is this, the city's prettiest church. It was built between 1547-60. 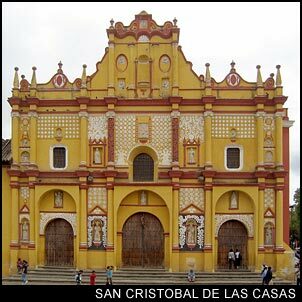 Its baroque facade is of soft pink-colored stone, while the interior is exuberantly decorated with gilt retablos. The attached Dominican monastery houses a good museum and an excellent shop (Sna Jolobil) with the region's best display of hand-woven textiles. A few blocks further to the north is the city's colorful eight-block-long mercado. It is best visited in the morning or on Saturdays. Use discretion when snapping pictures. MUSEO DE LOS ALTOS DE CHIAPAS: Located next to the Templo de Santo Domingo, this museum deals mostly with the history of San Cristóbal (signs in Spanish only). TEMPLO DEL CARMEN: Dating to 1597, and formerly part of a nunnery, this mustard-colored church is next door to the city’s Casa de la Cultura. Its unusual bell tower dates to 1680. CENTRO DE ESTUDIOS CIENTIFICOS, Na-Bolom: This handsome colonial-style building on the outskirts of town houses the city's most important cultural institute. Founded by Danish-born explorer and archaeologist Franz Bloom and his Swiss sociologist wife Trudy, the center is dedicated to the ethnological and ecological study of the region. The center has taken a keen interest in preserving the tropical rainforest, Lacandon region, and its Mayandescended tribe of a few hundred Indians. Franz Bloom (who died in 1963) directed the excavations at Palenque in 1923. His wife lived here until her death in December, 1993 at the age of 92. The center has an excellent library, museum, and a cozy 12-room guest house (see below for details). Guided tours in English are offered Tues-Sun at 4:30pm. LAGUNAS DE MONTEBELLO: Lagunas de Montebello is 155 km or a 2.5 hour drive from San Cristóbal. It is a 2,400-acre national park on Mexico's southern border with Guatemala. Its 60-odd lakes are each a unique color due to mineral oxidation. The park is wonderful for wildlife viewing and hiking. Full-day tours operate from San Cristóbal. Along the way you'll pass through Comitán, a pretty village of cobbled lanes and pastelhued houses. It was founded in 1527. SAN JUAN CHAMULA & ZINACANTÁN: A few miles outside of San Cristóbal are two of the state’s most interesting Indian villages, San Juan de Chamula and Zinacantán. Deeply religious and more of pre-Conquest than modern times, these fascinating, traditional villages are home to the Tzotzil people. Both have excellent markets on Sundays. Escorted tours are the only way to visit these towns. ARCHAEOLOGICAL SITES: For those itching to see more Mayan ruins, the state has three other sites of importance. Toniná is located 13 km east of Ocosingo. It features several large stone buildings terraced into the hillside and engulfed by the jungle. Yaxchilán is an impressive ceremonial center along the shore of the Usumacinta River. Nearby Bonampak is renowned for its colorful (although now fading) frescoes dating to the sixth century. Both Bonampak and Yaxchilán are southeast of Palenque nearly 180 km They are best reached through an escorted 2-night tour of both sites (arranged by several San Cristóbal travel agencies; cost is around $90 U.S. per person). TRIUNFO BIOSPHERE RESERVE: Near the southern tip of Mexico, outside the town of Tapachula, lies the Triunfo Biosphere Reserve. Named after an inactive volcano, El Triunfo (The Triumph), this is a comparatively small reserve that protects what may be the most spectacular misty forest remaining in North America. It's not easy to reach the Triunfo Reserve. After a brief car ride from the village of Mapastepec to the outskirts of the reserve, you begin a 22-km hike to your campsite, gradually leaving the 20th century behind. As you make your way through the reserve, you'll camp beside sparkling clear mountain streams. Bed down overlooking a waterfall, all the while surrounded by the luxurious vegetation of 30-foot ferns and 100-foot trees, wrapped in the cool clouds and mist that hover near the summit of the volcano. Over 300 species of birds make their home here, several of them found only in this region. One of the most spectacular is the brightly plumed quetzal, which figured so prominently in the Toltec and Aztec cultures. Oddly enough, even with the quetzal's brilliant green, white and vermillion plumage, they're hard to spot as they perch among the vines and tree ferns. You will also see plenty of hummingbirds, flycatchers, forest falcons and manakins. You may even catch a glimpse of the azure-rumped tanager, a brilliant blue and green bird that's fairly common in this forest and in similar habitats in neighboring Guatemala. But these are very likely the only places in the world that it exists.